Humility, service, love, family and faith are vital pillars of any stable community. My wife and I enthusiastically witnessed these highest of human qualities at a little Baptist church in Plains, Georgia. 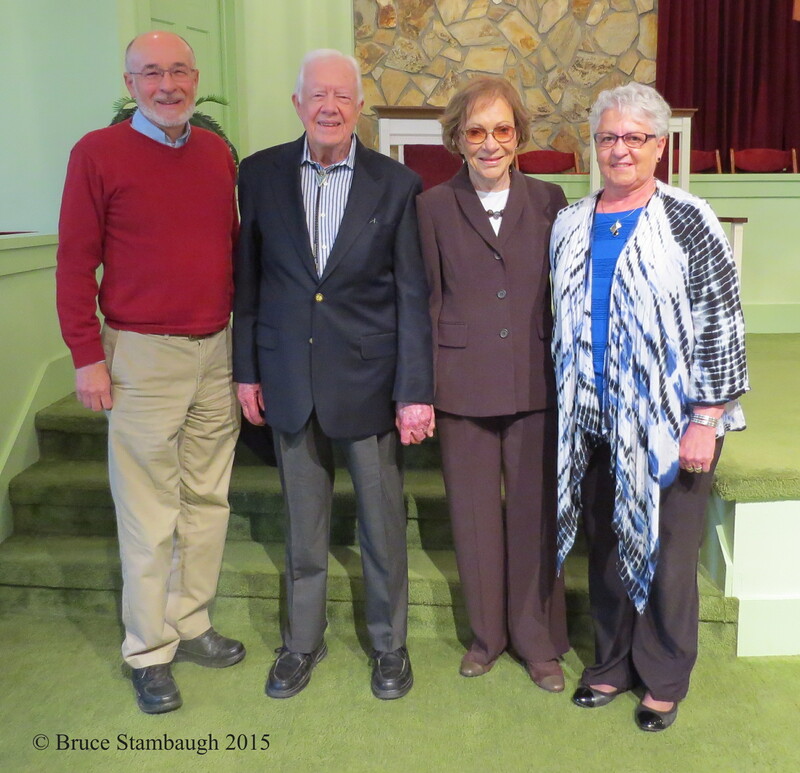 We knew we wouldn’t be the only ones who would want to hear Jimmy Carter teach Sunday school. When the former president is scheduled to teach, the tiny congregation of 30 swells to 10 times that amount, sometimes more. The good folks at Maranatha Baptist Church know what to do. They are ready for the ensuing onslaught. So are the authorities. When we arrived at 8:30 a.m. at the modest church that damp, gray Sunday morning, a police dog checked every vehicle entering the property for bombs. Though we were plenty early, a line of people already stretched from the front door, down the cement sidewalk to the parking lot. 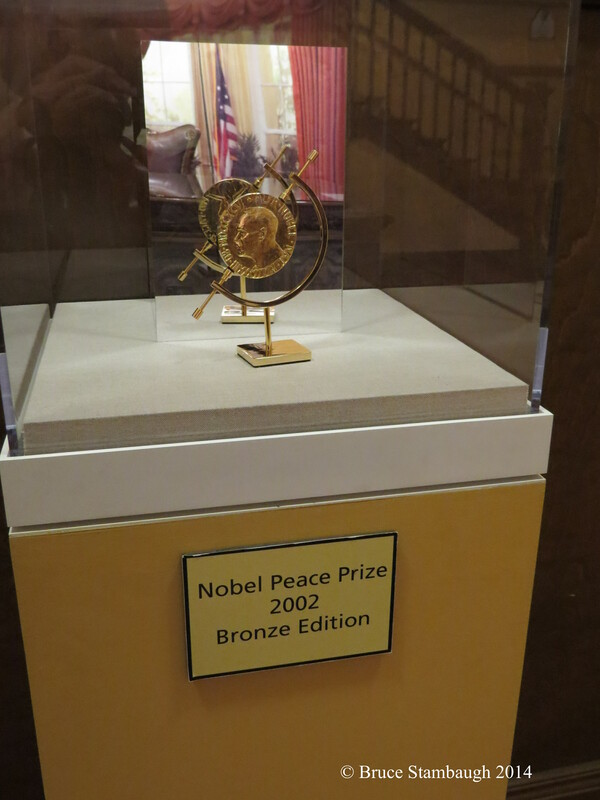 By now, former President Carter has developed quite the reputation as a teacher, humanitarian, and world-renowned peacemaker. At age 90, he and his equally gracious wife, Rosalynn, are still putting their faith into action. My wife and I joined the queue to enter the red brick building. A stern looking woman popped onto the church’s front porch to announce the procedures for entering. She spoke loudly and resolutely so everyone could plainly hear the specific instructions to make everything go as smoothly as possible. Secret Service agents greeted us inside the door. We emptied our pockets onto a table and removed our coats. Another officer checked everyone with a wand for any suspicious objects. Miss Jan spent the next 45 minutes kindly but firmly going over all the rules of conduct. Included were not standing or clapping for the president and no photography during the class or worship. We could take pictures during Jimmy’s brief introduction. After a brief break, Miss Jan, who had taught the Carter’s daughter, Amy, in elementary school, had us all bow our heads for a prayer. 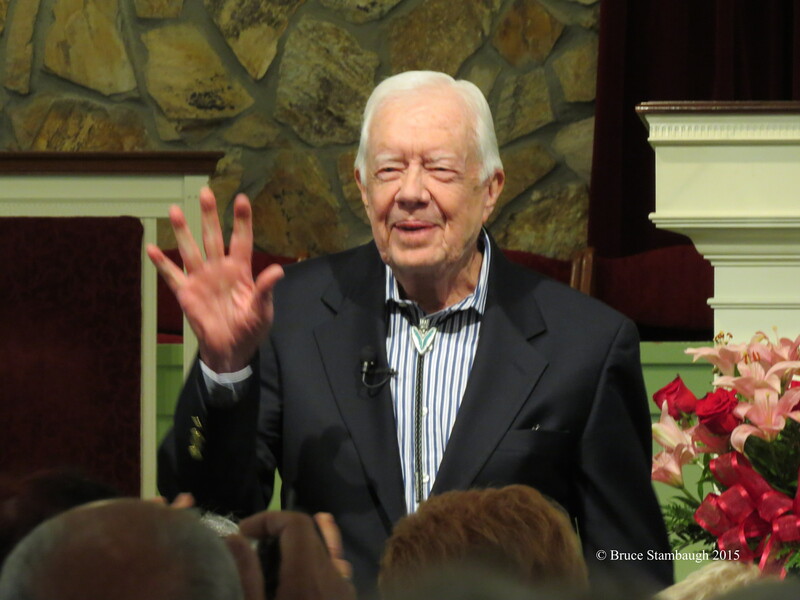 When she said, “Amen,” Jimmy Carter surprised the congregation when he rose and began addressing the crowd. He and his Secret Service guards had quietly sneaked in during the prayer. We hung on his every word. Miss Jan kept watch over the assembled. She occasionally hugged or bent down to shake the hand of a Secret Service agent, as if she were welcoming them back to a family gathering. The affection they shared was for more than themselves. Their common assignment of protecting the president they loved and admired expressed their uniform devotion. The topic was loving God and your neighbor. 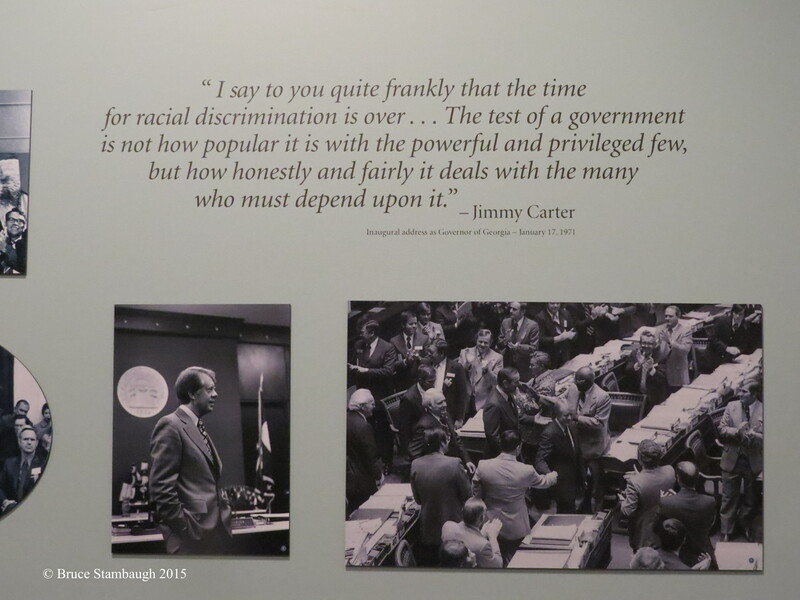 Jimmy humbly shared how organizations he supports, like the Lions Club, Habitat for Humanity, and The Carter Center in Atlanta, help him put this charitable concept into global deeds for peace and human rights. Jimmy used the word “humble” several times, pronouncing it the old-fashioned way, without the beginning “H” sound. It modeled his southern, gentlemanly hospitable manner. After the service, Miss Jan resumed command, dismissing us by rows to have our pictures taken with Jimmy and Rosalynn. When she came to our row, I told her she must have been an excellent teacher. Miss Jan winked, smiled, and quietly thanked me. Miss Jan had instructed us not to either shake hands with the Carters or to talk to them so that everyone could get through the process as quickly and efficiently as possible. When the lady taking the photo with my camera clicked the shutter, Rosalynn whispered to Neva that the flash hadn’t gone off. That was so thoughtful of her. The picture was fine, just like Jimmy and Rosalyn Carter, and Miss Jan, too. The communion cup of love, faith, family, humility, and service generously overflowed in Plains, Georgia. We were grateful to have been partaken. 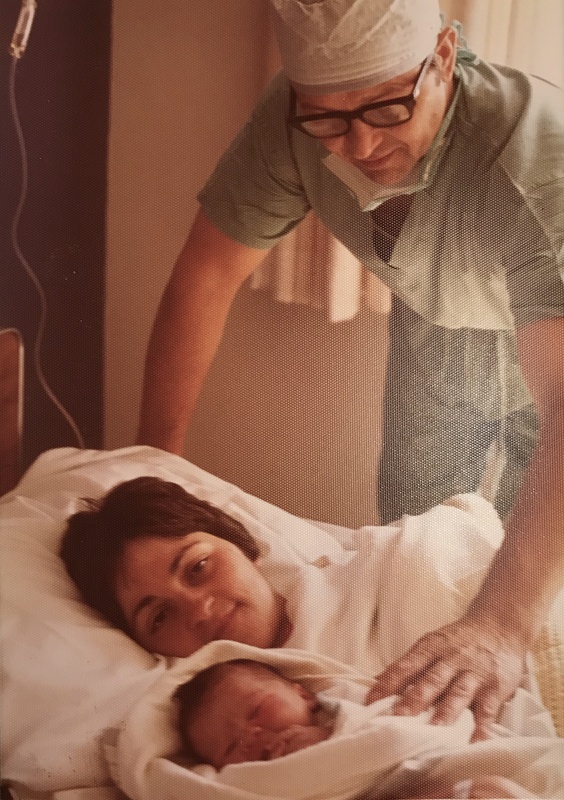 Given his many maladies and his age, Carl Maxwell, 77, of Berlin, Ohio, would have every right to simply give up on life. Instead, he has done just the opposite, and many people are the beneficiaries. The list of all the good Maxwell has done in his life far exceeds his list of illnesses. Kidney dialysis three times a week, congestive heart failure, diabetes, quadruple bypass surgery on his heart, suffering four heart attacks, staph infections and skin cancer head the list. Maxwell hasn’t let any of that stop him. If anything, they serve as incentives to live life to the fullest everyday. He does so personally and through several community organizations for which he volunteers. Maxwell has and is doing a lot by any measure. His accomplishments would be impressive for someone in excellent health. Maxwell was a charter member of the East Holmes Lions Club and is a charter member of the newly established Berlin Lions Club. He served as president of the East Holmes club, and was recently presented the prestigious Melvin Jones Fellow award by Lions Club International. 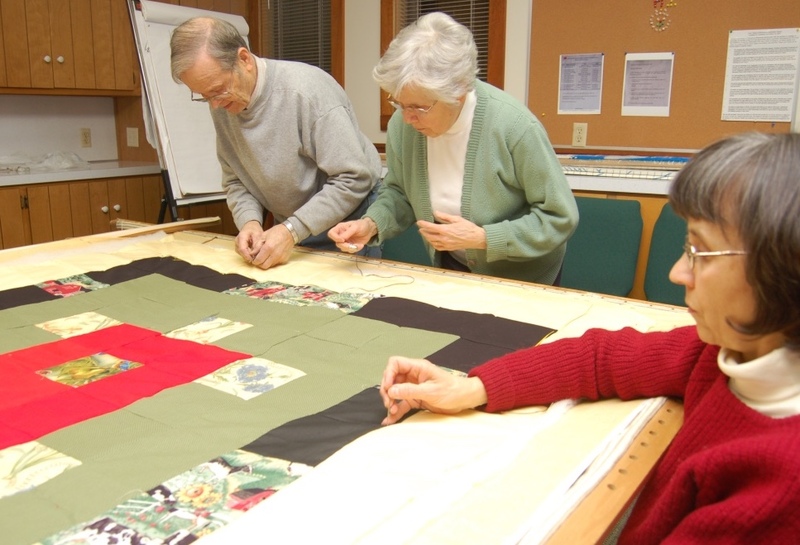 “I’m especially interested in the sight aspect of Lions Club,” Maxwell said. Lions Clubs collect used eyeglasses and distribute them to needy people around the world. Maxwell has served as either president or vice president of the East Holmes Fire and EMS District board since its inception in 2000. He is the at large member of the five-member board. Maxwell, along with his wife of 53 years, Lorene, volunteer at Save and Serve Thrift Shop in Millersburg twice a week. “On Tuesdays,” Maxwell said, “I cut rages with Paul Roth.” He and Lorene also help out as cashiers on Thursday evenings. 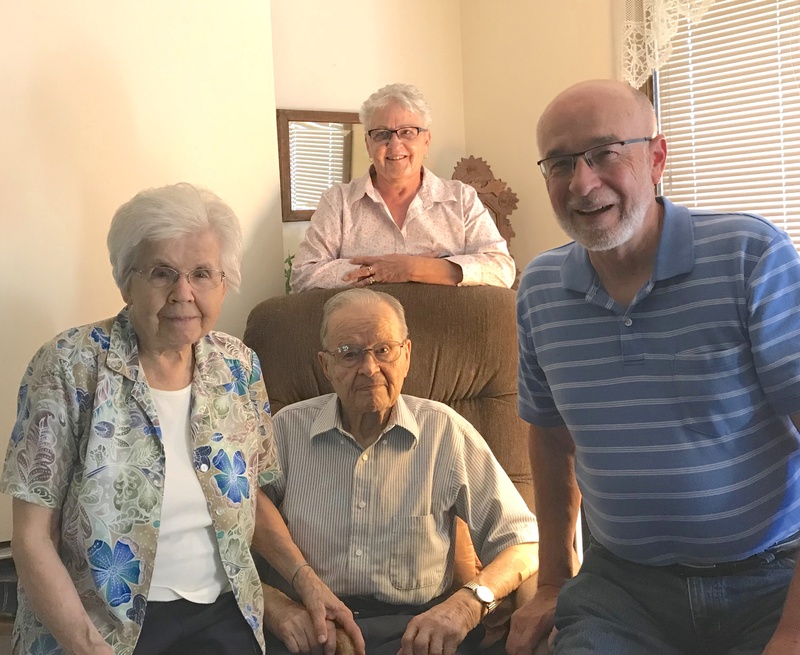 Maxwell has also taught Sunday school at several levels at Berlin Mennonite Church for many years. “I like people,” Maxwell simply said. If he did slow down, no one would question his decision. Maxwell goes for kidney dialysis three times a week in Wooster. “Counting my time on the road,” he said, “each visit takes eight hours.” Maxwell is not complaining about that. “I didn’t really want to do dialysis,” Maxwell said. “But I got out voted 5-1 on that.” His loving wife and four sons all wanted him to do the treatments. Maxwell drew the line there. “I had an opportunity for a kidney transplant,” Maxwell said, “but I turned it down.” He said he felt someone younger than him should have a chance at the available kidney. “I couldn’t live with myself if I had taken a kidney that some 20-year old needed,” Maxwell said frankly. 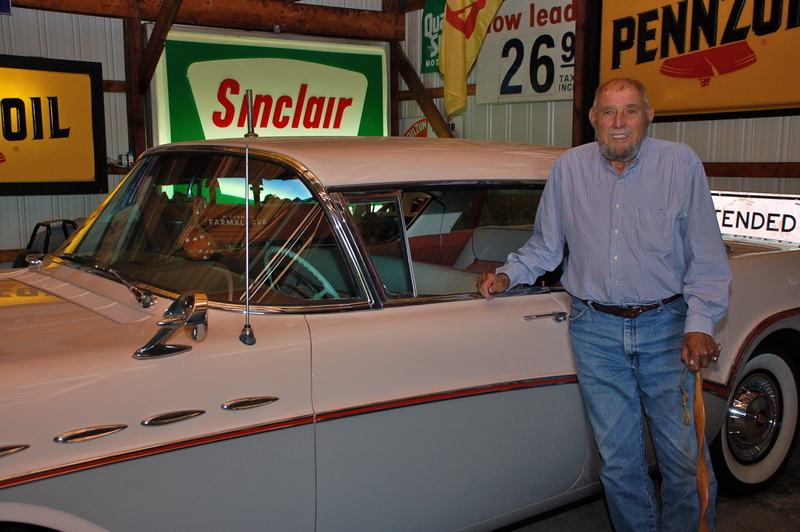 Carl Maxwell showed off his salmon and grey 1958 Buick. Maxwell doesn’t spend all of his time volunteering. He also has some heart-felt hobbies in which he has invested much time and money. Maxwell, who once had 14 antique cars, now has three old cars and a 2002 Corvette, which he calls his “toy.” He occasionally drives it to his dialysis sessions. 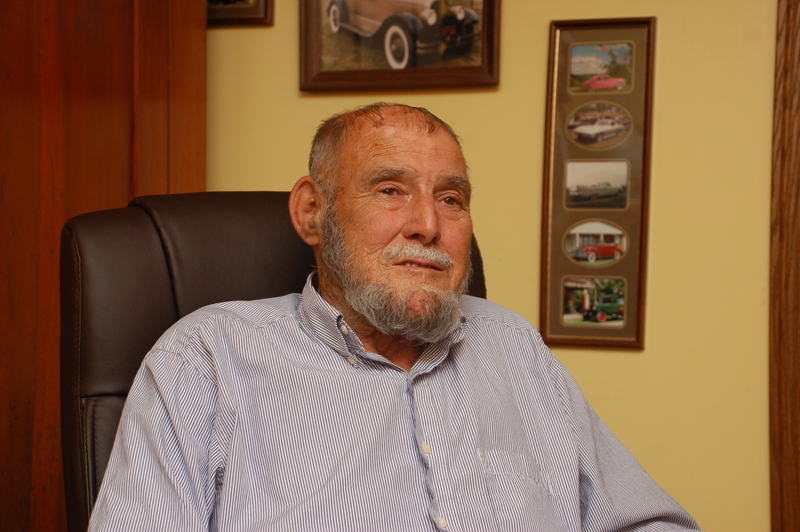 At the peak of his car collecting days, Maxwell served for 16 years on the regional board of directors of the Antique Car Collectors of Canton. 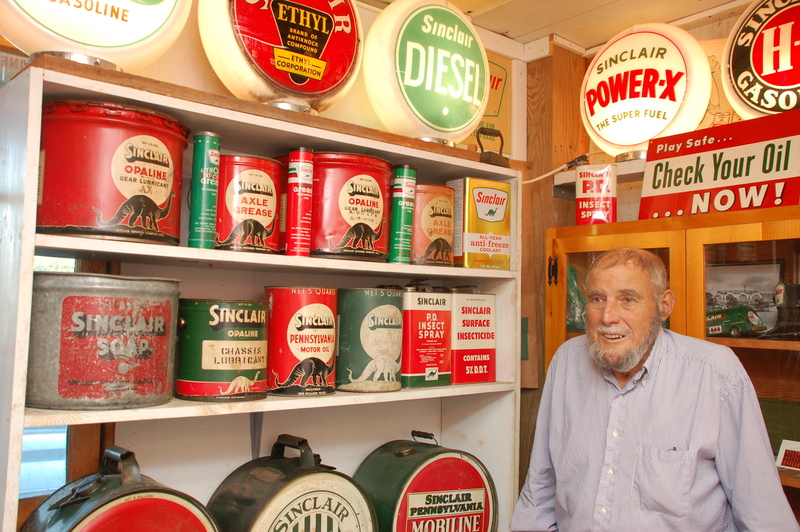 Maxwell also has the world’s largest collection of Sinclair Oil products and memorabilia, which was featured earlier this year in an international collection magazine. From old gas and oilcans to large advertising signs to refurbished gasoline pumps, Maxwell’s collection is clearly one-of-a-kind. He has gathered items from many states and even other countries. That extensive collection stems from his life’s work. 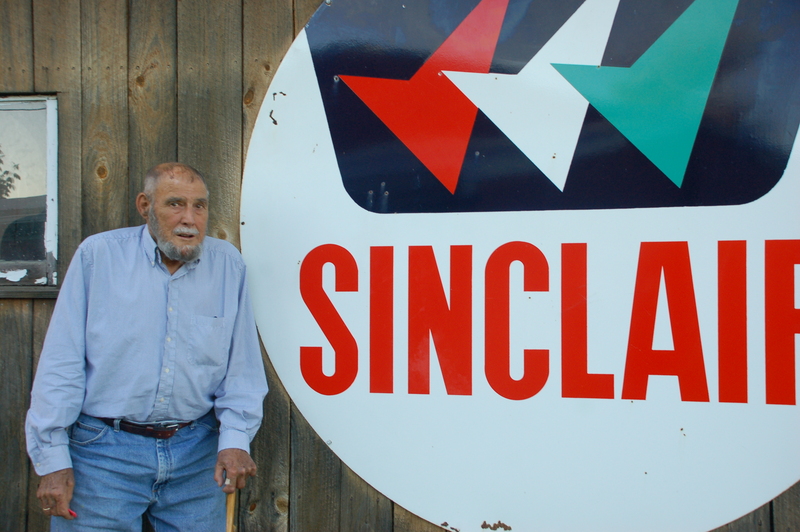 Carl Maxwell has two triple-check Sinclair Oil signs displayed at his barn. He said only a handful remain. Maxwell worked 36 years for Holmes Oil, which originally distributed Sinclair products. He started as a truck driver, but after six years, he and Maynard Hummel became co-owners of the business. Maxwell sold his half interest in the business after 30 years. “I have had an unbelievable life,” Maxwell readily shared. He credits two women for those experiences, his wife and his late mother, Edna Weaver Maxwell. “I owe a lot to others, especially my wife,” he said. “She’s just been amazing.” He said Lorene has been an incredible help to him in his many times of need. Maxwell said he recognizes his physical limits and takes the time to rest so he can continue to keep his busy pace. 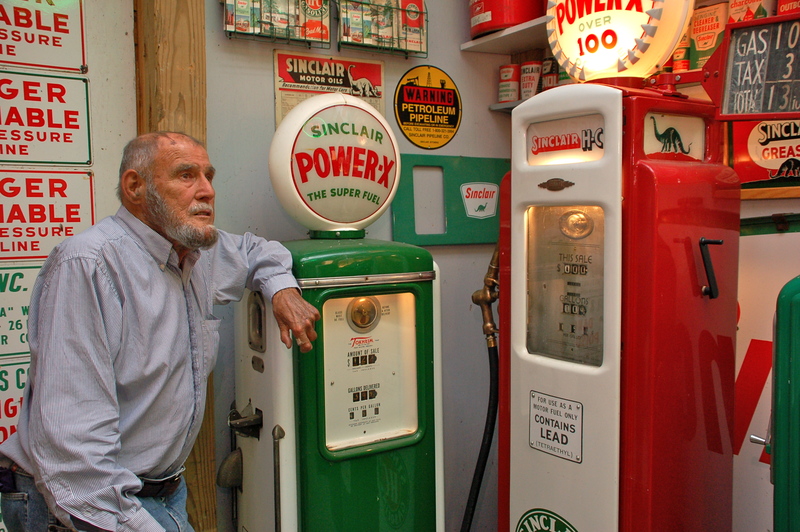 Carl Maxwell has collected Sinclair Oil signs, cans and even gas pumps. This article appeared in the July 2, 2012 edition of the Bargain Hunter, Millersburg, OH.